Those who know 18-year-old Fatah Adan say he acquired his sense of humor and equanimity from his mother, Habibo Osman, and father, Abdi Adan Hussein. Family is at the heart of Fatah Adan’s success. 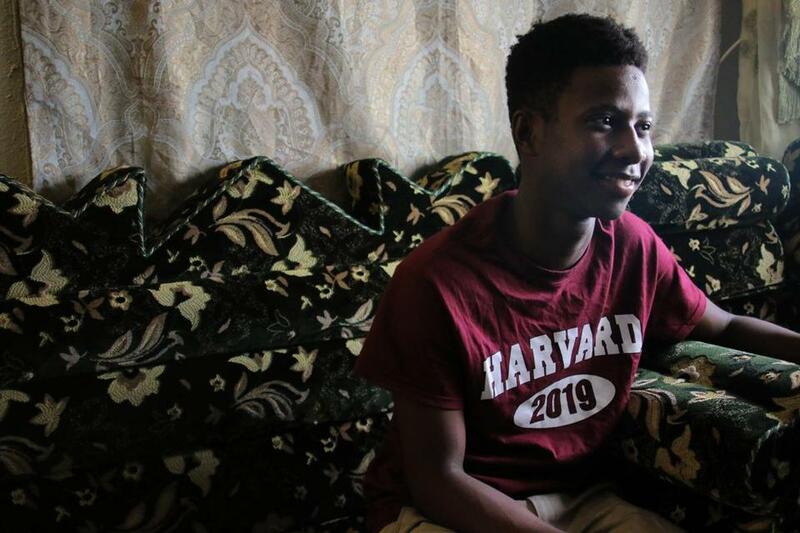 Devotion to his eight siblings and their Somali parents, who fled civil war to give their children a better life, has guided his journey from birth in a refugee camp to Harvard University, where he will be a freshman this fall. “There’s a kind of reverence that he has toward his mother and his father that I think is unique among teenagers in America of any generation,” said Ravi Singh, Fatah’s debate coach at New Mission High School in Hyde Park, where Fatah is this year’s valedictorian. Fatah, 18, credited his parents with giving him the will to succeed. Singh, who recruited Fatah for the debate team when he was a freshman in Singh’s history class, said he was an unusually poised 14-year-old, even at a tournament when his debate partner, Elvis Alvarado, was homesick and Fatah faced off alone in the final round against two juniors. Those who know Fatah suggested that his humor and precocious equanimity come from the perspective he learned from his parents, Abdi Adan Hussein and Habibo Osman. Married in 1985, Hussein and Osman fled Mogadishu in 1992 for a refugee camp in Kenya, where they lived for six years until a United Nations refugee program brought them to Boston. Fatah and his older brother Jamal were born in the camp, where, Hussein said, conditions were overcrowded and “sometimes terrible,” with armed men stealing food from families. Natives of a country that is hot year-round, the family had a hard time adjusting to Boston winters, and the war left Osman with post-traumatic stress that caused her to panic at loud noises. As years passed, a longstanding kidney condition worsened, weakening Osman. She needed a transplant and was fortunate that Hussein was both a medical match and an eager donor. Her illness, along with their parenting responsibilities, delayed Osman and Hussein’s plans to study English, which they began last year. They were influenced in part by observing their children’s education, they said. But their hard work — in learning English and in all their struggles — also inspired Adan. 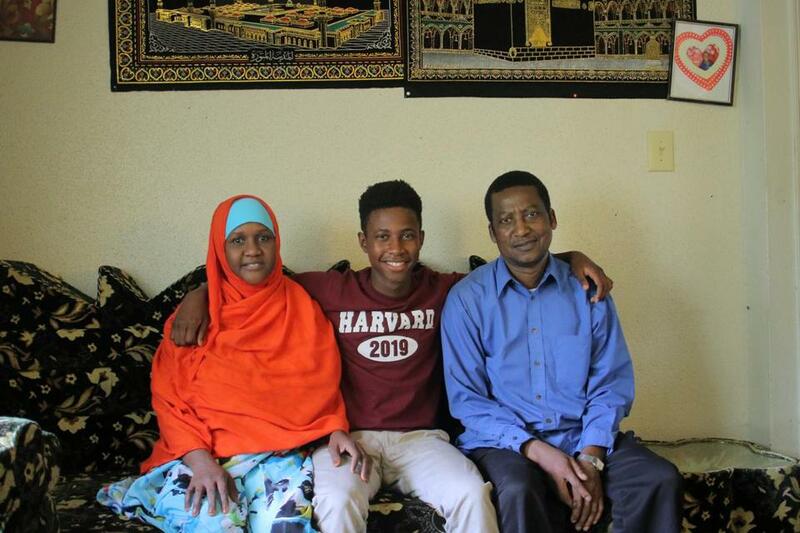 “I saw my mom with post-traumatic stress disorder, I saw her sick, and I saw my parents trying to get adjusted to a new country,” Fatah said in a recent interview at his family’s Roxbury home, where traditional Somali sectional sofas encircle common rooms with ample seating for the large family. Dozens of debate trophies fill a glass cabinet. Hussein and Osman said they work hard to set a good example, starting with their own relationship. Their parenting is evident in the academic success of their children. Fatah was accepted at eight of the nine colleges to which he applied, turned down only by MIT. His younger brother, Mohamed, who is ending his freshman year at New Mission, appears to be following a similar path. “The other freshmen regard him as my freshman class regarded Fatah,” Elvis said. Older brother Jamal, now a rising junior at Boston University, is also a standout student. “He was the first to go to college, so he showed us that we could do it. I was trying to mimic him . . . and ended up doing better than him and being more successful,” Fatah said with a laugh, and a hint of pride. The family is held in high esteem by the local Somali immigrant community, said Ali Abdulkadir, a family friend who has known Hussein and Osman in Somalia, the refugee camp, and in Boston. “All Somalian people are proud of them,” said Abdulkadir, 53, who lives in Dorchester. With such a foundation, Fatah isn’t intimidated by Harvard, where only 12 percent of undergraduates are black and where many classmates will come from elite private schools with more advanced courses than the New Mission curriculum could possibly offer. Fatah does not need to worry. He knows the rules.